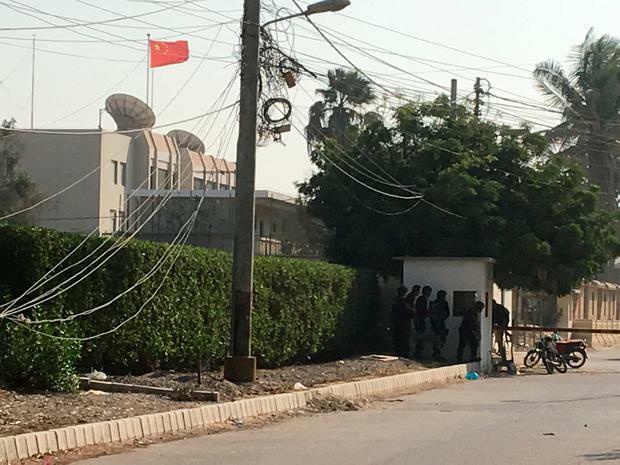 Two police officers have been killed in a shootout after gunmen stormed the Chinese Consulate in Karachi, authorities have said. Smoke was seen rising from the building as the shootout continued. Mohammad Ashfaq, a local police chief, said more than two attackers stormed the consulate on Friday. He said security forces have surrounded the area. Local TV shows smoke rising from the building, which is also the residence of Chinese diplomats and other staff. Authorities said the attackers first opened fire at consulate guards and then managed to breach the main gate and enter the building.